The problem average Americans have with the Special Counsel’s Russia investigation is understanding how the multifaceted bits of information publicly reported over the past two years all fit together like puzzle pieces that come together into a clear picture. Two new efforts to connect the dots of the Russia investigation are now available. Craig Unger, an investigative journalist and writer who was deputy editor of the New York Observer and was editor-in-chief of Boston Magazine and a contributor to Vanity Fair, and the author of previous books such as House of Bush, House of Saud: The Secret Relationship Between the World’s Two Most Powerful Dynasties (2004) and The Fall of the House of Bush: The Untold Story of How a Band of True Believers Seized the Executive Branch, Started the Iraq War, and Still Imperils America’s Future (2007), is out with a new book, House of Trump, House of Putin: The Untold Story of Donald Trump and the Russian Mafia (2018). Building upon the work of Craig Unger, and others such as David Corn and Michael Isikoff, Russian Roulette: The Inside Story of Putin’s War on America and the Election of Donald Trump, there is also a new documentary film from director Jack Bryan that attempts to connect the dots of the Russian attack on America’s 2016 election, Active Measures (2018). “Active Measures” could hardly be more perfectly timed. It’s a documentary that digs into the relationship between Donald Trump and the powers of Russia, and while it’s not as if the film comes up with some smoking gun that Robert Mueller hasn’t yet, it fills in the Trump-Russia connection in a dogged, rigorously reported, eyebrow-raising way. 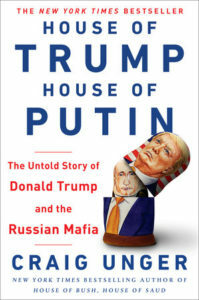 The movie is a follow-the-money exposé, and the director, Jack Bryan, lays out the roadmap of cash by making bracing and detailed connections between all the forces at work: the snaky leader-thug Vladimir Putin; the oligarchs he placed under his thumb (except for those who wouldn’t cooperate — he got rid of them); the Russian mobsters who are enmeshed in the workings of the Putin government; and Trump himself. 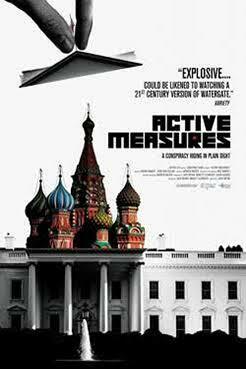 “Active measures” is a phrase used in Russia to describe political warfare by the security services to influence the course of world events, but the movie says that if you want to understand the collusion between Trump and Russia, don’t focus on the 2016 election. The collusion goes back decades, and that’s its real meaning. Once Putin assumed power, government critics, including a number of the country’s top journalists, began to turn up dead, and it’s no surprise to hear about Putin’s links with organized crime. But to the extent that “Active Measures” focuses on a kind of Russian mob mentality, it is not, primarily, about murder or the destruction of free speech. It’s about money laundering. Russia’s preeminent crime boss, a human grizzly bear named Semion Mogilevich, is said to be worth $10 billion, and he was the first Russian to figure out how to launder money on a mass scale. That meant interfacing with the West. 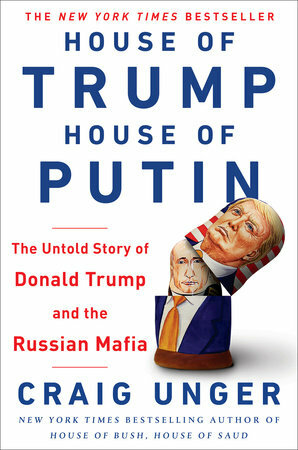 Trump Tower, which opened in 1983, was one of the first buildings in New York where shell companies could buy and sell condos without identifying themselves, and it became what Craig Unger of Vanity Fair, in the movie, calls “a money-laundering paradise.” Russian mobsters, such as David Bogatin, began to deal with Trump the year after Trump Tower opened. A little later, the Trump Taj Mahal in Atlantic City was supposed to become Trump’s flagship, but it was a famous debacle that left him in ruins. Apart from its failure as a business, it was charged with violating money-laundering statutes. Trump, famously, was up to his eyeballs in debt, and since he’d filed for bankruptcy half a dozen times, American banks wanted nothing to do with him. All those loans had been his financial Viagra; now they’d dried up. But that’s what made him the perfect mark for the Russians. According to the movie, Trump would never have found his way back had it not been for the flow of cash from the Russian underworld. The rest of “Active Measures” is devoted to filling in Russia’s fake-news propaganda efforts (something it does a thorough job of, though not nearly as deep a one as that found in the chilling, yet-to-be-released documentary “Our New President”, a satirical portrait of Russian meddling in the 2016 election told entirely through Russian propaganda), and to the Manchurian Blowhard conjecture that many of us now indulge in on a daily basis, based on the following facts: that Trump, in pushing for the breakup of NATO, has openly pimped for one of the cornerstones of Putin’s wreck-the-West strategy; that at the Republican Convention, language supporting the independence of Ukraine was excised from the party platform at Trump’s request (something that still shocks John McCain); and, of course, the outrageous daily evidence of Trump’s clear and persistent man-crush on Putin. Arriving on the heels of last week’s verdicts, “Active Measures” plays as a heady warm-up to whatever’s coming next. We don’t have the big picture — yet — but this movie does an expert job of connecting more than a few of the dots. Active Measures is available on several online streaming services, including Hulu and Vudu.